1) The first thing you want to do is organize the ride. This can be as informal as standing around in a parking lot, or as complicated as a special meeting to hand out maps and cell phone numbers. 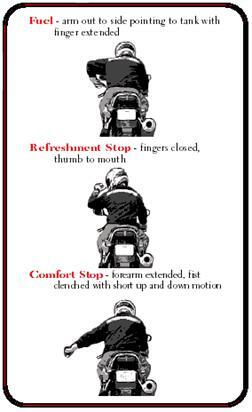 10) All riders are also responsible for making sure their motorcycles are mechanically up to the task. Before you even meet up with the group, make sure you've got plenty of fuel in the tank, and you've taken care of all those maintenance issues. Not sure what to check? Use T-CLOCK. You really don't want to be the reason for stopping the group for something mechanical you could have prevented. Point at ground, rub fingers together -road is slippery. Flash brake lights very rapidly Major watch out! Be prepared to stop QUICK. 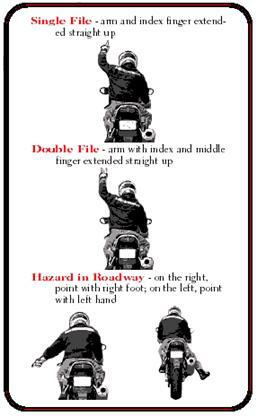 Point at another rider, then point to side of road pull over now. Waving arm in quick downward motion, with palm down and parallel to ground - slow down! Often used for bikes traveling in the opposite direction to warn of hazard or police. Point forward, shrug shoulders I don't know where we're going, I probably shouldn't be leading! Little wave to oncoming motorcyclist "Aren't motorcycles great?" 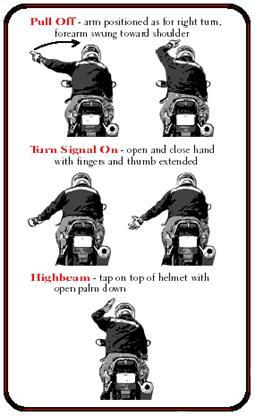 Finally, when someone gives you a signal, you should nod your head so they know you understand, since they can't see your face very well behind a helmet. Canyon Bombing Single file, fastest to slowest. Leaders should stop at intersections if there's a chance someone could make a wrong turn, and also periodically (perhaps every 10 minutes) to make sure everybody's still there. Be sure to signal turns well in advance. Don't fixate on the rider ahead, watch the road. If this is a problem, drop back. When passing cars, don't assume that when the rider ahead of you goes, you can too, or that they won't abort their pass and nail the brakes! When passing multiple cars, watch for the cars deciding to pass also! Glance in your mirrors before pulling out. City Streets Two per lane at stops, staggered while riding. Don't split traffic if not everyone has their own lane. Signal and get in the correct lane in plenty of time. Avoid unnecessary lane changes. With larger groups it won't be possible to stay together, so split into smaller groups. If someone gets stranded at a light (leaders must watch for this! ), the leaders can pull to the side of the road in single file and wait for them, assuming there aren't too many leaders. In all cases, the leaders must keep track of what is happening behind them, as it is much more difficult to pass information forward than back. It can also be a good idea to designate a sweeper, generally an experienced rider who agrees to ride last in line and make sure everyone is OK. When going on runs, meet at a predetermined place of start on time. Start the ride as a group and come back as a group as this promotes safety in numbers. It's much more enjoyable (and safe) when everyone in the group follows the same plan. Happy riding!